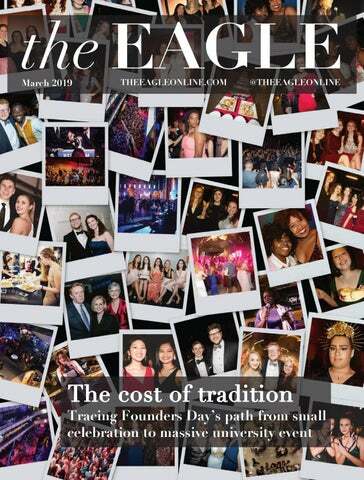 The Eagle is American University's 92-year-old newspaper of record. We reach readers with our website, email newsletter and print edition. It is editorially independent of the university. The Eagle was named Best Less-Than-Daily College Newspaper by the College Media Association in 2017. Our website receives about 50,000 page views per month. Our email newsletter reaches over 2,100 subscribers every Friday morning. Our special print editions typically run twice per semester with 2,500 copies. If you would like to buy an advertisement with The Eagle in our print, online or email editions, please contact our business manager at businessmanager@theeagleonline.com or call (202) 885-1409. In 2017, our website received more than 500,000 page views and 460,000 unique views. It is our newspaper's centerpiece, where we publish 3-5 articles daily during the school year. Payment is due upon initiation of ad run for new advertisers. Our email newsletter, launched in August 2017, has over 2,100 subscribers with a 35 percent open rate. The industry average open rate is about 18 percent. It goes out every Friday morning with a roundup of stories from the week. By advertising in our newsletter, you will get a clickable banner at the bottom of the weekly email for our readers to learn more about your products or services. The Eagle typically prints two special editions per semester, adding up to four per calendar year. In the fall of 2018, we will release our print editions on Oct. 19, which falls during parent and alumni weekend, and Nov. 30.